A recent program funded by the Office of Naval Research, as a Department Research Initiative (DRI), has focused on the sea state and boundary layer physics of the emerging Arctic.1 The Sea State and Boundary Layer Physics of the Emerging Arctic program was motivated by the observed increase in surface wave activity that has been coincident with the seasonal reduction in sea ice. The focus on this research was on the autumn refreezing conditions in the western Arctic (i.e., Beaufort and Chukchi seas). The emerging Arctic is defined by less sea ice and larger expanses of open water in summer. Waves have a larger role to play in this regime. As its first effort, the program developed a climatology of the sea state in the region—to identify factors affecting its spatial and temporal variability—and showed that the wave activity is indeed increasing. Next, the program planned and executed a 42-day field measurement campaign on the R/V Sikuliaq during the autumn of 2015. The measurements included arrays of drifting buoys to measure waves, winds, and sea ice, with a particular focus on storm events. Shipboard measurements of atmospheric and oceanic profiles complimented the buoy observations. Numerous remote sensing observations were collected coincident with the field measurements. These provided context and spatial coverage for the sparse in situ observations. Details from the field campaign on the R/V Sikuliaq, including images of the formation of sea ice, are presented in a short video titled Arctic Sea State, created by the Applied Physics Laboratory, University of Washington. Along with the field campaign, the program developed and applied models for wave-ice interactions. These have been calibrated using the field data and several of the formulations are now available in the WAVEWATCHIII community wave forecast model. Models for air-ice-ocean interactions have also been tested and improved with the field data, including investigations of wave-driven enhancements to upper ocean mixing and ice edge effects on the lower atmosphere. Results from the program have been compiled in a special issue of the Journal of Geophysical Research – Oceans. 2 Most of this issue is online now, with the full volume expected by summer 2018. A key observation is the prevalence of pancake ice, which indicates that surface waves are having a significant effect on sea ice formation in the region. This can result in strong feedbacks, in which waves affect the sea ice and then the sea ice damps the waves. Another central observation is the importance of atmospheric forcing, especially the rapid freezing caused by off-ice winds. To accompany the special issue, the program has curated and published the data set with the intent to provide a benchmark for testing future models as they evolve and improve. 3 Of particular interest and importance is the development of fully coupled air-ice-wave-ocean models 4 that would be capable of representing the strong feedbacks observed. For further information, see the project website. Sea State DRI Science Team for R/V Sikuliaq 2015 (left to right): Ethan Roth (ship's tech), Mike Hoshlyk (Captain), Martin Doble, Bjorn Lund, Byron Blomquist, Erick Rogers, Jeff Anderson, Ola Persson, Maddie Smith, Jim Thomson, Alex de Klerk, Peter Guest, Toshi Maki, Alison Kohout, Robin Clancy, Peter Wadhams, Guy Williams, Hayley Shen, Ted Maksym, Sharon Stammerjohn, Steve Ackley, Ben Holt, Blake Weissling, Bern McKiernan (ship's tech). Not Pictured: Bob Ziegenhals, Steve Roberts (ship's tech). Photo courtesy of Jim Thompson. 4 Editor's Note: Coupling refers to communication and interchange of information between models. Jim Thomson was raised on the coast of Maine and worked in the sailing industry there prior to beginning a career in physical oceanography. After completing a PhD in MIT's joint program with the Woods Hole Oceanographic Institution, he joined the University of Washington's Applied Physics Lab in 2006. Dr. Thomson also has a joint appointment in the faculty of Civil & Environmental Engineering. 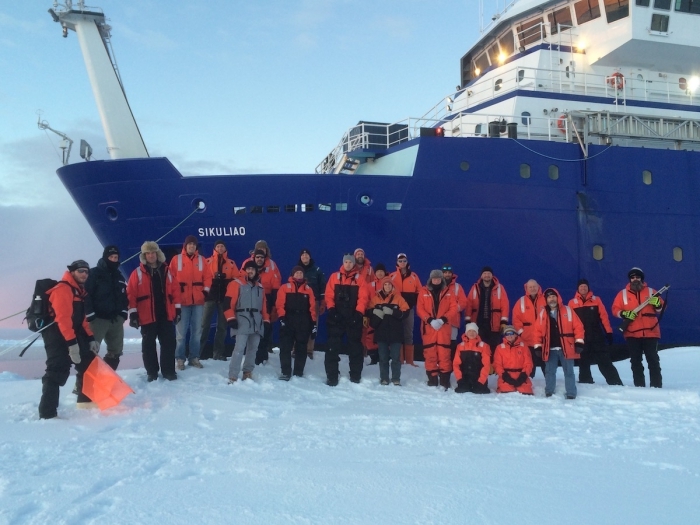 Dr. Thomson studies waves and turbulence at the surface of the ocean, including interactions with sea ice. His work emphasizes field measurements and physical processes and includes the development of instrumentation and autonomous platforms. Applications for his work include remote sensing synthesis, model development, and naval operations.